360 dregres amaizing Penthouse with view of all Havana located in the 8th floor of on of the emblematic houses of Prado ” Edificio Areces” in Calle Prado 106, build in the first quarter of the 20th century by Ramón Areces, the creator of Corte Ingles. For many years this building was in very bad condition, in the year 2015 we fell in love with this building and we commemorate to restore it. Started refurbishing the lift shaft and the main structure of the building from the 3rd to the 8th floor preserving the building from falling down. 2017 we could finish the restauration of the main stuctural part of the building, avoiding that almost 200 people have to move to emergency shelter, we are many families to keep their homes. 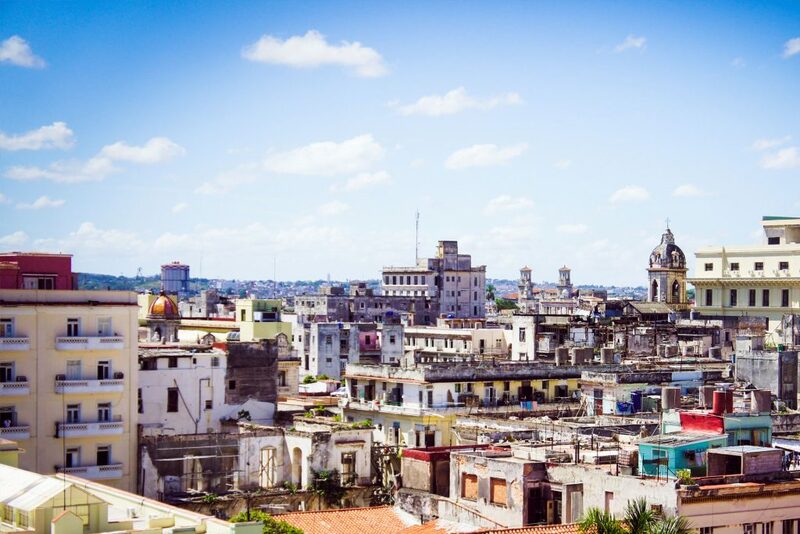 The penthouse is situated 5 steps from Malecon, Habana Vieja, directly to the most important highlight of the historical city, like Capitol, National Museum of Modern Arts, Parque Central as well as theaters, restaurants, bars, hotels and cafés and only 1 street away from the ‘Malecón habanero’. This exclusive penthouse is totally secluded is an “adults only” 100% private accommodations has a total living space of 250 m2 . This space has been designed to accommodate only person it has a 360 degress view of Havana. You can enjoy different impressions of the city from all spaces of the apartment, 1 bedroom with a view over the whole Malecon even from the kingsize bed, kitchen, bathroom with capitol view, and dining room with view to Malecon and the first Open Air Livingroom in Havana with a wide terrace with view to the entrance of Havana Bay, Paseo del Prado Capito, etc. TV incl. DVD player – Available on request. Privacy and confort for our guest is the most important part of our concept. Our guest live completely alone and independent. We provide our guest with 3 key sets, to access the apartment at anytime. Nevertheless we are always available for any guest necessity. My personal overview: I personaly love to be in Prado, the area is mixture between old cuban glamour and reality… I walk outside and stay at Prado,,, this large promenade with big trees, if I look to the right and see The Capitol and the indescribable ” Gran Theatro de La Habana and the big white luxurious Hotel Manzana, if I look to the left and see the sea, the bay entrance with it old castle “Castillo del Morro”. If I walk the street Virtudes beside the apartment, then I´m into the reality of havana with it morbid charm and the normal Cubans. And if I go straight ahead, there is the modern building of the National Museum of Modern Arts „ Arte Cubano“, I go forward and dive into the narrow streets of old havana.